Day one of Oscar Pistorius's murder trial saw his neighbour testify that she heard a woman's terrified cries for help, followed by gunshots, from the direction of his home on the night Reeva Steenkamp died. The testimony came after a sombre, soft-spoken Pistorius pleaded "not guilty, My Lady" to the State's charge of premeditated murder as the sensational trial got underway on Monday, with most of it shown live on television. The State immediately set out to debunk his version of events, in which the disabled athlete has maintained he believed he was shooting at a intruder hiding behind his locked toilet door. State prosecutor Gerrie Nel called Michelle Burger, an academic, who lives less than 200 metres from Pistorius's home and said she heard a woman scream in deathly anxiety -- supporting the State's case that the accused and Steenkamp had argued shortly before he shot her. Speaking in Afrikaans, Burger told the court she was woken up that night by the "blood-curdling screams" of a woman, followed by four gunshots. Burger said she and her husband woke up just after 3am when they heard the noise, and her husband rushed to the balcony. "She called for help. She screamed terribly and shouted for help. Then I heard a man also call for help. He called for help three times." Burger said she believed she was hearing the sounds of a robbery in progress and her husband called security guards and asked them to investigate. "Then I heard her screams again," said Burger. "It was like a climax. I heard her anxiety. She was very scared." Then came the shots, with a pause between the first and second shot, rapidly followed by two more. "It was bang... bang, bang, bang," she said. 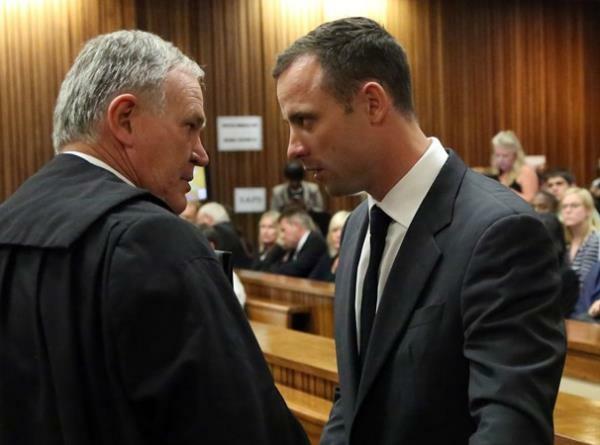 After the court's lunch break, Burger was aggressively cross-examined by Pistorius's advocate Barry Roux who tried to show that she was biased against his client and that her recollection was confused. At one point, Roux put it to Burger that when Pistorius became anxious his voice rose to sound like that of a woman, and that at a distance of just under 200 metres she possibly could not hear the difference. Burger was firm however that although she also heard a man scream, it was the "fear from her (Steenkamp's) voice that startled" her. Roux also questioned why she did not hear Pistorius breaking down the locked door with a cricket bat after the shooting. "You come from an attitude ... when you heard Mr Pistorius's version at the bail application you immediately decided it cannot be true. "You decided if he said Reeva was not screaming, he was lying. In your view, he cannot be telling the truth." But Burger insisted that she could not understand how she could unmistakably have heard the cries but Pistorius never heard it. Roux retorted: "What you believed... was a woman screaming." Nel objected to Roux's line of questioning more than once, pleading for fairness to the witness. Earlier Nel had told the court that since there were no eye witnesses to the event, it would therefore rely on circumstantial and forensic evidence to convict the 27-year-old athlete nicknamed "Blade Runner". "There were only two people in the house, there were no eye witnesses," Nel said. "The State's case is based on circumstantial evidence... and on what the neighbours heard... and lead ballistic and forensic evidence. Pistorius, in a statement read out by his attorney, suggested that the State had compromised evidence -- a reference to bungling by now retired investigator Hilton Botha -- and said the State was clearly trying to build a case on besmirching his character. Roux is expected to continue his cross-examination of Burger on Tuesday when the trial resumes at 9.30am. It began 90 minutes late on Monday as justice officials had to locate an interpreter to allow Burger to give testimony in Afrikaans. While the opening arguments of the State and the defence were broadcast live on television, her face was not shown as she had requested to testify off camera. It remains unclear whether Pistorius will take the stand in what has been dubbed the trial of the decade. Burger could be followed by more than 100 other State witnesses. More than 300 reporters have vied for space in the court room and an overflow court and a scrum of local and foreign photographers have set up watch outside the court.